This is inside the cabin seen on Time Stand Still...I was amazed that the photo turned out as well as it did. Inside it is so dark that I for sure cannot see to focus, so was amazed that the camera did as well as it did. Sarah and Lo are here...actually they are gone to visit a friend right now. I thought I would take advantage of it and do a post right quick. Tney had some strong winds for just a few minutes day before yesterday and were without power for over 24 hours. I cannot imagine being without AC now. I would not like it one bit, but it would really be hard for some people. That cabin looks like some of those we visited on the Lincoln Trail. What a great photo...the camera captured it very well even in low light. I hope the storms come our way with some rain. I would hate to lose air right now, too. It is really miserable here! Wow! That is some rocker. How many babies were rocked to sleep there? That cabin certainly has alot of things to look at, doesn't it???? I'm glad your camera came through so well for you. This is a great looking old rocking chair. It's looks so dusty and authentic. Fine shot. You did quite well taking that picture; looks great! We have a wooden rocking chair in our living room. I would like to buy a cushion that you tie to the chair. The rocking chair would be more comfortable, if it were cushioned. LOVE that rocker. Wish it could talk!! 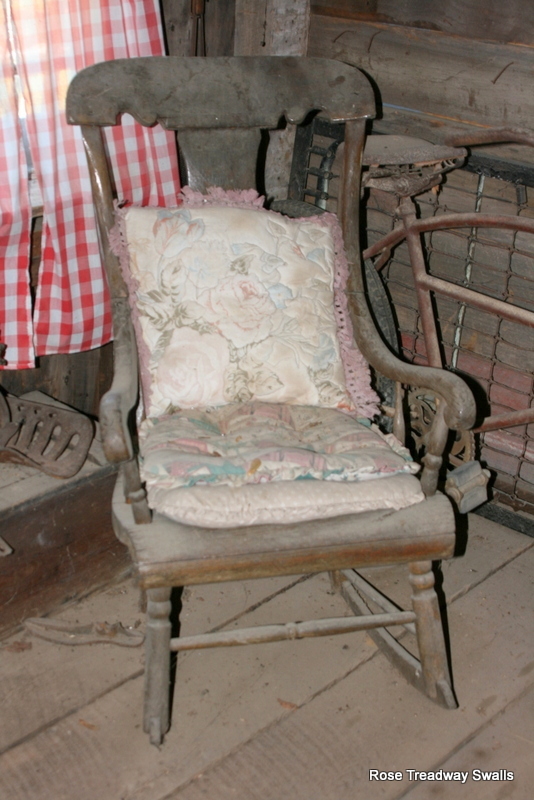 What a neat old rocker, this is the kind of place I love to visit. Today is a bit cooler her than it has been. I hope it is for you too!